Partial-year data for 2017 indicates a softening in international student numbers in New Zealand last year. Education New Zealand’s latest data release reflects year-to-date trends for the first two trimesters of the year – that is, up to and including August 2017. As of that point in the year, total enrolment amounted to just over 106,000 international students. This represents a 7% decline from the same period in 2016. A look behind those top-line values reveals that the biggest factor here was a 30% decline in the unfunded PTE sector (i.e., private training centres that do not receive government funding). And more specifically: a notable decline in PTE students from India and the Philippines. PTE numbers fell off by nearly half (47%) for each of these important sending markets. This big drop in PTE registrations reflects as well an overall decline of 29% in Indian student numbers through August 2017. India remains a major source market for New Zealand’s educators, and, even with numbers off by nearly a third through the first eight months of 2017, still accounted for almost one in five foreign students (17%) in the country last year. For that matter, half of all international students in New Zealand come from China or India, and, while falling Indian numbers placed an overall drag on growth in 2017, one bright spot was that university enrolments rose by 7%, fuelled in part by increasing post-secondary numbers from both China and India. 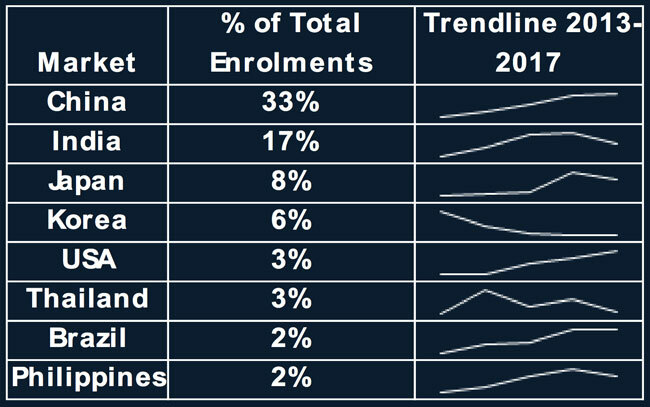 Education New Zealand frames the current enrolment trend as a “planned rebalancing” of the country’s foreign enrolment. The shift from what had been a heavy reliance on PTE numbers to other education sectors appears to be part and parcel of that rebalancing. But so too are ongoing efforts to diversify by sending market while also growing foreign enrolments in regions throughout the country (in order to balance the historical concentration of student numbers in the major urban centre of Auckland). “We’re committed to ensuring that international students have a high-quality experience while studying here and return home as great advocates for New Zealand,” said Education New Zealand Acting Chief Executive John Goulter. Against that major drop from India, New Zealand also saw increasing student numbers from a wider field of sending markets through August 2017, including the US, Colombia, Chile, Indonesia, and Vietnam. However, most of these, with the exception of the US, grew on what was a pretty small base for 2016. Due in part to that that shifting pattern in favour of higher education enrolments, the overall economic impact of international education in New Zealand is projected to have held relatively steady in 2017. Total sector value is estimated at NZ$4.4 billion (US$3 billion) for the year. This is down only marginally from the NZ$4.5 billion economic impact observed in 2016, and places education squarely among the country’s top export sectors. We will update the overall enrolment levels for New Zealand when full-year data for 2017 is released later this year. For the moment, however, early visa tracking data suggests that substantial growth may continue to be elusive in 2018. 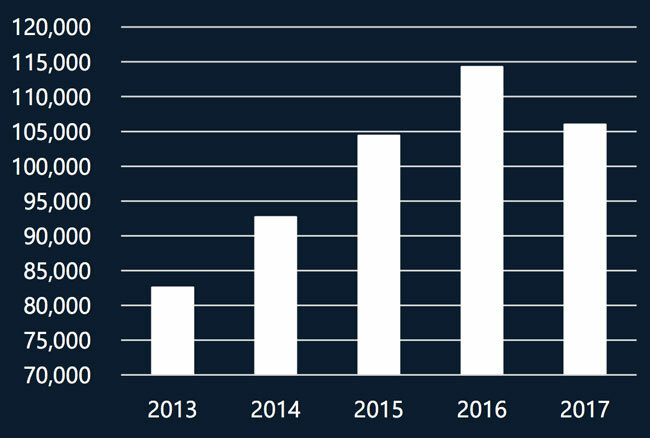 As reported again by Education New Zealand, overall visa numbers are relatively stable year-over-year, with the YTD total of valid visas up 4% over the same period for 2017. However, the number of first-time visas issued – which we can understand to be a reasonable proxy for student commencements – is down 6% in the first quarter of 2018. The interesting thing about the early data for 2018 is that the sharp decline in Indian enrolments from 2017 appears to be levelling off into a much flatter trend through the first months of this year. Instead, it is softening numbers from China that are pushing student commencements down in 2018 with the number of first-time visas issued to Chinese students off by 22% through the first quarter of this year. Needless to say, this all adds up to a very compelling pattern for the year ahead with important shifts in sending markets, sectoral distribution, and regional distribution within the country all in play. This entry was posted in Australia/Oceania, Higher Education, K-12, Language Learning, New Zealand, Regions, Vocational and tagged Private Training Establishments, high schools abroad, universities with international students, study abroad, international students.